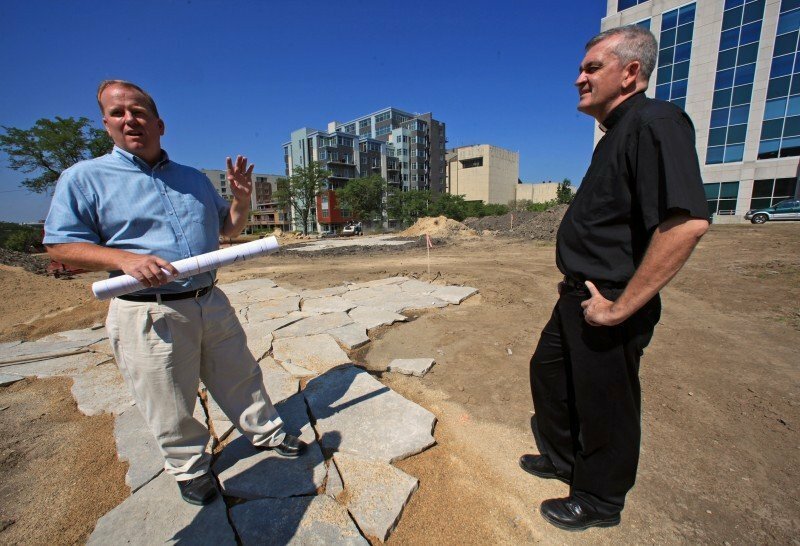 Mark Landgraf, left, of Landgraf Construction, gives Monsignor Kevin Holmes a tour of the Stations of the Cross path under construction on the site of the arson-destroyed St. Raphael Cathedral in Downtown Madison. 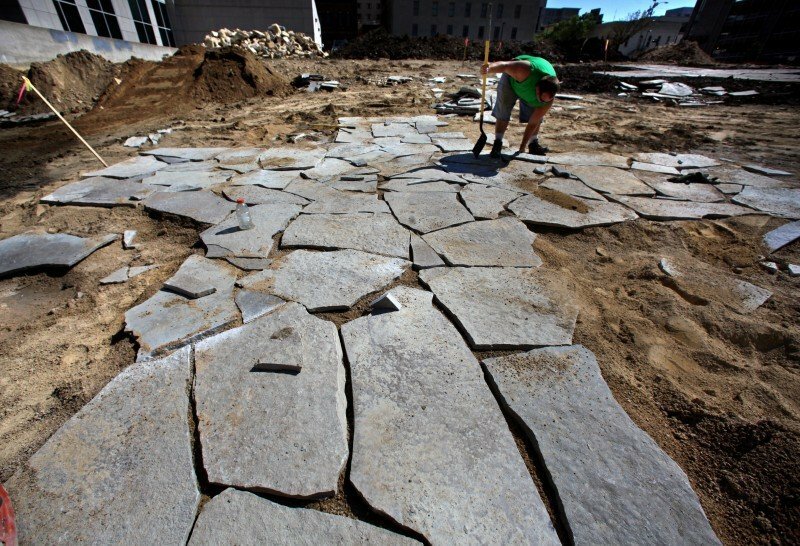 Kevin Knuteson of Kalscheur Landscaping assembles a jigsaw puzzle of Wisconsin flagstone to form one of the 14 crosses at a Stations of the Cross park in Madison, two blocks from the state Capitol. Stone crosses appear on the site of the former St. Raphael Cathedral along West Main Street in Madison. A walking path commemorating Christ’s final hours is expected to be completed by mid-September. Workers install one of 14 stone crosses at the site of the former St. Raphael Cathedral, destroyed in an arson fire in 2005. A Stations of the Cross walking path is intended as an interim use of the site until a new cathedral can be built. The Downtown Madison site of St. Raphael Cathedral, which was destroyed by arson in 2005, will be turned into a park-like public space that will include an elaborate walking path commemorating Christ’s final hours. The project by the site’s Catholic owners is estimated to cost between $50,000 and $100,000 and is considered an interim use of the land until another cathedral can be built there. That is still years off, said Monsignor Kevin Holmes, pastor of Cathedral Parish, the name given to three Downtown Catholic congregations, including St. Raphael’s, following a 2008 merger. The 1.31-acre site will include a Stations of the Cross walking path. The name denotes a Catholic devotional exercise in which participants stop at 14 stations, each commemorating a scene of Christ’s suffering and death. “Walking the Stations of the Cross, like walking a labyrinth, integrates the whole self — body, mind, soul and spirit — into the experience,” said John Leonard, chairman of the religious studies department at Madison’s Edgewood College. The money and effort being spent on the project are further signs the Madison Catholic Diocese is serious about keeping the property a sacred site and available for a cathedral, Holmes said. The walking path is expected to be done by mid-September. The 150-year-old St. Raphael Cathedral, 222 W. Main St., was badly damaged by an early-morning fire on March 14, 2005. William Connell — a homeless, mentally ill man — is serving a 15-year prison term for arson for burning the church, which was the designated cathedral for the 11-county diocese. As such, it housed the bishop’s chair, the symbol of his authority. In 2007, Bishop Robert Morlino announced plans to rebuild a cathedral on the site, but the next year, he “paused” the project, citing a poor economy and a desire to convince more people it was needed. Brent King, diocesan spokesman, referred questions to Holmes, who said the cathedral project remains on hold with no precise time frame. Cathedral Parish, which owns the property, is paying for the installation of the Stations of the Cross. A significant portion of the money would have been spent anyway on turf to maintain the site in a way suitable to the city, Holmes said. Many Catholic churches incorporate Stations of the Cross in their sanctuaries, often through depictions of scenes in stained glass, sculpture or paint. However, an outdoor Stations of the Cross in an urban setting is rather unusual, said Holmes, noting it will be just two blocks from the state Capitol. The walking path will be made of crushed red granite. At 14 points, the path will be interrupted by crosses imbedded in the ground and created from Wisconsin flagstone. To reduce the potential for vandalism, there will not be depictions of biblical scenes at each station, Holmes said. Rather, brochures at the path’s origin will explain the significance of each numbered cross, and plantings will capture the intended mood of each station. Red blossoms will suggest Christ’s crucifixion, white blossoms his resurrection. The Stations of the Cross devotion has its roots in the 4th-century liturgy for Holy Week in Jerusalem, Leonard said. As the various events during the week were read from the Gospel, the community retraced the steps, visiting shrines and basilicas built to celebrate those events. A new cathedral one day will replace the Stations of the Cross, but a smaller version of the walking path could be incorporated on the site, Holmes said. Since 2008, the steeple and spire from the St. Raphael Cathedral have been stored outside Reynolds Transfer & Storage Co. on the 700 block of E. Washington Ave. They sustained damage from high-pressure water hoses but otherwise are intact. The site was chosen because it was secure, available to rent and close to the cathedral site, said Monsignor Kevin Holmes. It always has been the hope of the diocese to place the steeple and spire atop a new cathedral, Holmes said. However, their reuse will rest on whether it is architecturally feasible to do so. “At this point, that’s not entirely clear,” he said.